Fruehere Ausstellung der Zonenkinder bei Miss Hecker in Berlin. „Warum bringst du übrerall Pfeile an? Du hast schon über 1000 Pfeile in ueber 26 Ländern, wie reist du? Next to Art Fair21, Modart is pleased to tickle your throat gently with its own brand of second hand smoke, an exhibition featuring a selection of young artists who live as art, who have risked to communicate, earned their street credentials and begun to stir up the hierarchies of fine visual arts. 2 rooms, 2 exhibitions, 1 rocking party in 1 tripped out amazing space. 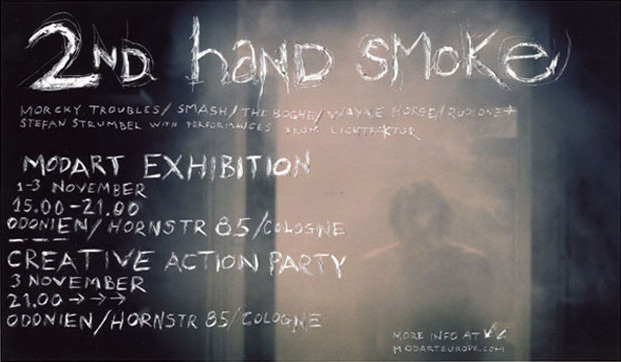 Featuring: Morcky Troubles, Smash, The Boghe, Wayne Horse, RudiOne and Stefan Strumbel and light painting performance from Lichtfaktor. You can visit the show daily from November 1st – November 3rd between 15:00 and 20:00. November 3rd, starting at 21:00 … light painting, vj’s, live musical acts, BBQ and a selection of booze, pls join us as we party in the name of art and see what gets the art of partying!!! Total super! Flickrgruppen, -sets und -user_innenalben im chicen 3D Outfit anschauen! Hier die Seite / Anleitung! Du browst gerade in den Berlin based Streetart / Urban-Art Blog Since 1984 Weblog-Archiven nach dem Monat Oktober 2007.